One of the people we’ve met since moving here is a young man who grew up in Cambodia but who is originally from Australia. (That makes him what we call an “adult TCK.”) After finishing university in Australia, he worked with TCKs (Third Culture Kids) in Phnom Penh for two years. On his blog wheresthescript.com he writes about (among other things) TCK issues. In addition to the post below, I hope you will also read his post 15 Years Ago which details his TCK experience and is a beautiful portrait of a parent’s love. The particular post that I’m sharing today (with his permission) was published about a year ago, and I go back to read it over and over again. Whether you are a TCK, a parent of a TCK, or don’t know anything about TCK’s, I believe his words give hope to all of us who are followers of the One True God. Walk in a pool of custard. (I agree). Read for a long period of time. Kill someone (…good to know). Walk without hands or legs. Say goodbye to my best friend. Thankfully most of the above are things that they will never be asked to do, that is, except for saying goodbyes. Unfortunately, it is one of the most painful downsides to being a TCK (third-culture kid). It gets to a point where no matter where you are in the world, you are always away from people you care about. According to some research, by the time a TCK is in their early 20′s, they have experienced more grief from goodbyes than most adults experience in a lifetime. As a TCK myself, that sounds pretty accurate. It wasn’t until I moved back to Australia for university that I noticed that life in our home countries isn’t quite as transient. I spent four years not having to say goodbye to the people around me. So this is what’s it like to have consistency? Huh? I’ve said so many more goodbyes in the 18 months I’ve been back in Cambodia than in the four years I was in Adelaide. This is just part of the TCK experience. As we opened up the discussion with our middle-schoolers, we asked them the simple question – who have you had to say goodbye to? Best friends. Favourite aunts. Pets. Siblings. For some, their last goodbyes were just that – last goodbyes. They never got to say goodbye to a dying loved one. They didn’t get to sneak in a last hug with their sick dog. The goodbyes hurt and they make them angry and they make them sad. And with that one question, it wasn’t long before something triggered and an ocean of emotions was let out. Tears that had been held back a long time were let out. They each understood each other’s pain and found a safe space to share those emotions. We had a plan for that night – we quickly threw it out the window. God had a better plan. To kick off the night, we had cut up potatoes, and then sent teams out to find the pieces. Once they had done so, they then had to put their potatoes back together with toothpicks. It worked – kinda. Sure, the toothpicks held the potatoes together, but the potato wasn’t healed, it was just a bunch of potato pieces, stuck together. We do the same thing. We try to keep our broken hearts and lives together. We hold on for dear life and try our best to keep everything from falling apart. All our hurt. All our disappointment. All our failures. We just try and hold it together so that maybe we can convince the world that we’re not really broken potatoes. The truth is – only God can heal our broken potatoes. We can try and most of us do. But we will never succeed. 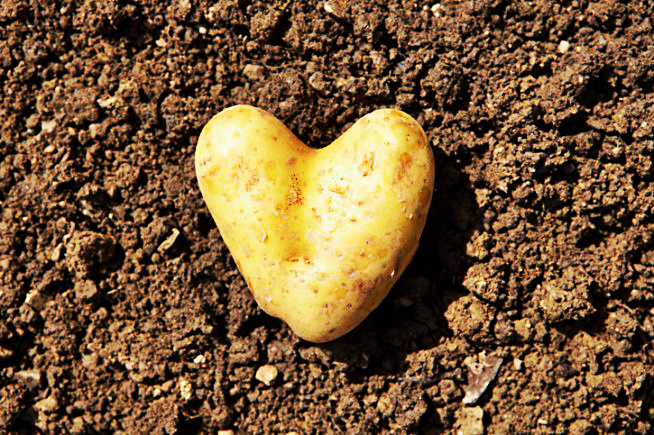 God made your potato and only God can heal your potato. Thank you for sharing this, Elizabeth.